Looking for an art gift for kids? This desk has tons of storage and shelves for them to keep all their work and supplies organized. 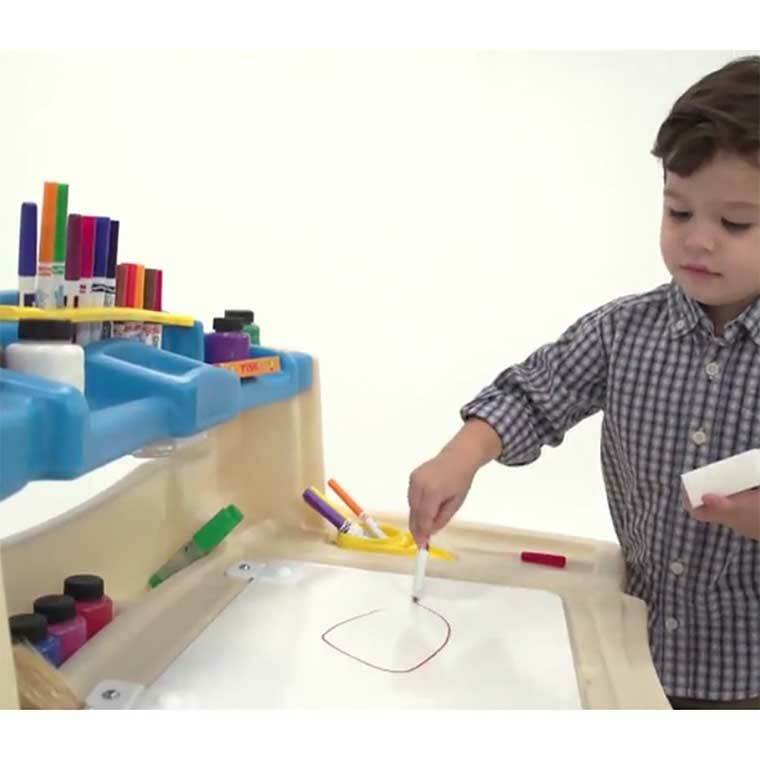 The hinged dry erase surface is fun for kids and easy to wipe clean. If you need an art gift for kids then this Deluxe Art Master Desk by step2 is perfect. It features a large work surface with many compartments and also has dry erase writing surface that wipes clean quickly and easily. It also comes with a great chair, push button light, shelf, organizer, four bins, coloring books, tables, and more! Kids and toddlers love the dry erase surface. The dry erase surface also reduces mess because kids won’t be going through tons of paper that you have to find somewhere to store. We all know what a mess kids and toddles can make with art supplies. As you can see in the image above the table has a push button light so kids can even work in the dark. The light does require three AAA batteries that do not come with the table. 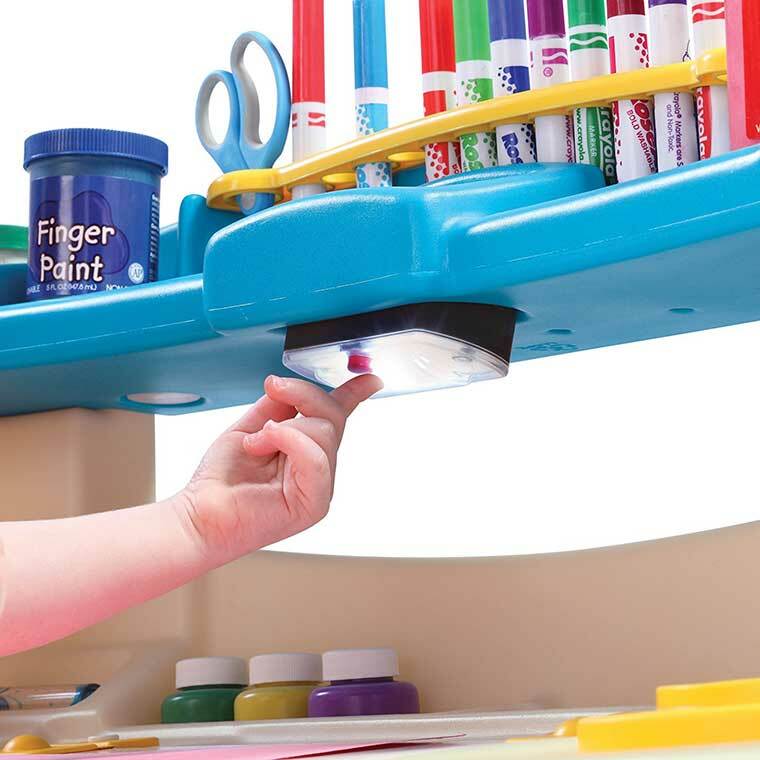 The kids art table also has a raised shelf that helps keeps there items and mess out of plain sight. 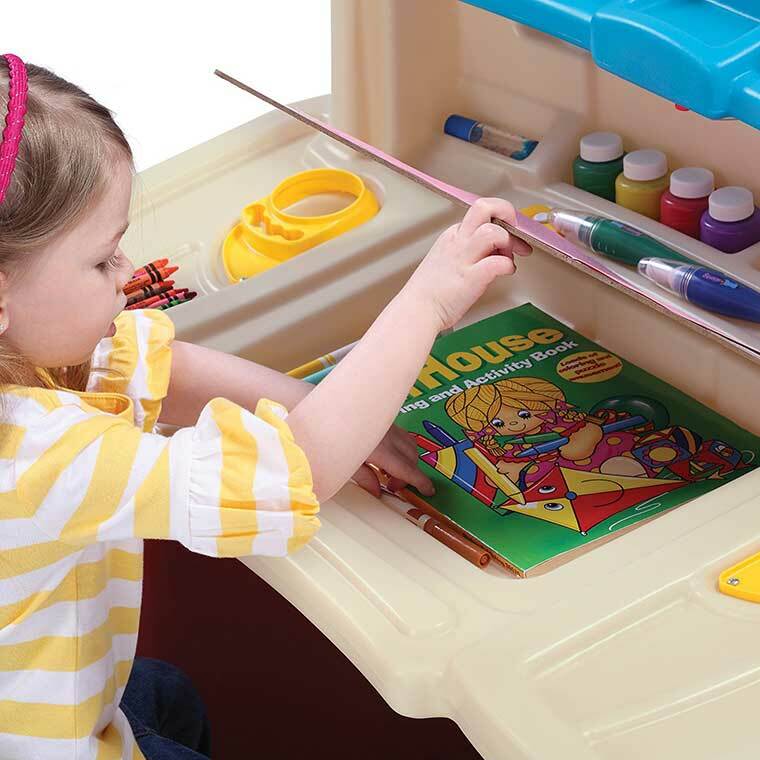 They can store their work and art supplies in the drawer so they have them next time they’re ready to get creative. The chair, which supports about 75 pounds, does come with the set. If you’re looking for gift for you kids this will be a home run. If you’re looking for an art gift for 6 year old, art desk for 7 year old, or art desk for toddlers this one is perfect (the recommended age is 3 and up). They will spend many hours being creative and building their imagination on the table. If you have any comments or questions feel free to leave them below.